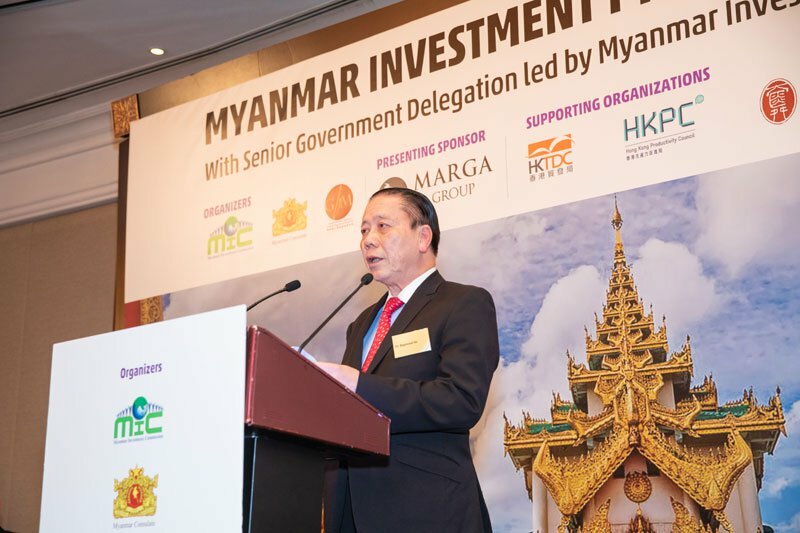 A Myanmar Investment Promotion seminar was held on October 16 at Island Shangri-La, Hong Kong. The seminar was attended by Mr. Edward Yau, Secretary for Commerce and Economic Development and Officials of Hong Kong SAR Government, Members of legislative council, Members of Hong Kong Development Council and Hong Kong Productivity council and representatives of over 130 Hong Kong firms and Hong Kong based foreign businesses. This is the second Myanmar Investment Promotion Seminar held in Hong Kong this year. It demonstrates Myanmar’s interest to deepen economic ties between Myanmar and Hong Kong, according to a statement. Hong Kong is one of the world’s leading financial centres, logistic hub, international legal and dispute services centre for Asia, and has positioned to play a prominent role in facilitating trade and investment flows and closer links to the economic integration between Hong Kong and ASEAN including Myanmar. In addition, Hong Kong is one of the key investors in Myanmar with the rank of 4th after China, Singapore and Thailand. According to McKinsey and Company, Myanmar needs 320 billion US$ investment for infrastructure by 2030. Additionally, Belt and Road Initiative has also come into importance in the current country’s economic outlook. China-Myanmar economic corridor, which will become an important part of BRI, will be implemented in the near future. To fulfil such investment amount and as one of the country’s priorities, it is crucial to persuade the strong interest of private sector in the form of public-private partnership (PPP). China-Myanmar economic corridor will be implemented in the near future, which can be considered as a part of the Belt and Road Initiative. The implementation of those projects requires large investment. Thus, it is crucial to persuade the private sector to participate in the form of public-private partnership (PPP). A number of important reforms have been made with regard to the legal framework as well as rules and regulations for investment. The new Myanmar Investment Law (MIL) and the new Myanmar Companies Law are the regulatory foundation that engenders confidence and transparency in Myanmar as a place in which to invest. The World Bank recognized the positive changes of Myanmar’s investment environment and consequently awarded the Star Reformer Award to Myanmar last year. Myanmar has granted visa exemption to Hong Kong and Macau SAR passport holders from October 1st of this year. “Given the close and friendly relations between Myanmar and Hong Kong, I am confident that the majority of the participants of this event will bring with them a deep understanding of Myanmar. I am equally certain that business executives and investors here in Hong Kong have been following with keen interest the positive changes in Myanmar” said Union Minister U Thaung Tun. He also mentioned that Myanmar Investment Commission is willingly to facilitate and create a predictable and investors friendly environment. He added Myanmar youth population is larger, highly literate, and highly motivated and therefore, there is a high human resources potential for those companies that are willing to harness it. Myanmar is ready to offer opportunities conducive to foreign investment. “We are delighted to meet with high-ranking officials, government representatives and business community in Hong Kong. I am confident that many of you will consider investing in Myanmar” said U Thaung Tun, Chairman of Myanmar Investment Commission. MIC delegation led by Chairman U Thaung Tun of Myanmar included Daw Nilar Kyaw, Minister for Electricity, Industry, and Roads and Communications of the Yangon Regional Government, U Aung Naing Oo, Director-General of the Minister of Planning and Finance and Secretary of Myanmar Investment Commission and Director U Myo Thu of Ministry of Commerce visited Hong Kong on 16th ~ 17th October 2018.